There are few things as critical to the quality of life in a community as the strength of its neighborhoods. A primary municipal vehicle to improving neighborhoods is a comprehensive housing plan. A visionary housing plan that clearly articulates goals, principles, needs, strategies and measures for success provides the greatest opportunity for targeted investment and desired outcomes. 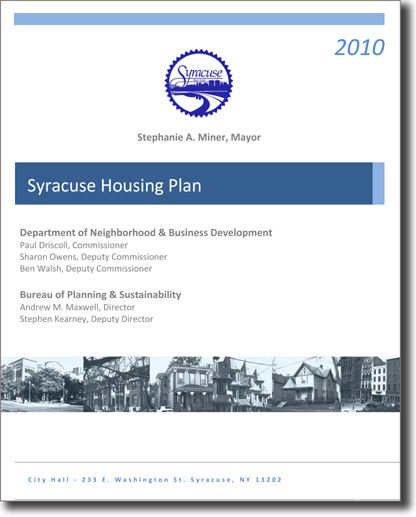 This plan represents the Housing Component to the City of Syracuse’s Comprehensive Plan: 2025, and lays out the roadmap by which the City of Syracuse will provide services and concentrate investments pertaining to our city’s housing stock and residential areas. The purpose of this Housing Plan is to both analyze the state of the City’s housing stock and to articulate the strategies to address the varying housing markets that exist in the City by neighborhood. These strategies are in the form of policy recommendations as well as an examination of tested and novel programs designed to address the various maladies cited as priorities throughout the City. Preserve: Rejuvenation of Syracuse’s housing stock through repair, improvement and rehabilitation of existing buildings. Assist Households: Encouragement of residents to remain in the City of Syracuse and invest in the upkeep and improvement of their homes. Build: Promotion of appropriate densities, and the diversification and improvement of the housing stock in the City of Syracuse through rehabilitation of existing housing stock and new construction. Improve Image: Promotion and enhancement the image of the City of Syracuse. More than 85 percent of the 42,000 parcels in the City of Syracuse are residential in nature. There are roughly 25,000 single‐family homes in the City and an additional 10,000 multi‐unit residential structures housing more than 60,000 households. The nature, type and condition of these residential uses vary widely but all fit together to form a patchwork of neighborhoods that provide a variety of living experiences from which to choose. All of these residential opportunities are situated in a new urbanist pattern or grid network abutting three primarily single‐use districts in the Lakefront, Downtown and University Hill. These districts serve the entire Central New York region with as the center for retail, government, and educational facilities providing jobs and services to tens of thousands of people each day. A series of commercial corridors provide services to the surrounding residential neighborhoods that combine to provide vitality and distinct character to the 20‐plus generally recognized neighborhoods that make up the City of Syracuse. • Identification of distinct neighborhoods within the City of Syracuse. Establishment of statistical indicators for the measurement of needs, goals and outcomes in city neighborhoods. Development of a “toolbox” of city directed programs to be applied to each neighborhood. The City of Syracuse believes it is important for the Department of Neighborhood and Business Development to assess the conditions of neighborhoods and needs of residents. As a result, the City of Syracuse is committed to analyzing data from the 2010 census in an effort update and to make informed changes to this housing plan. This Plan is aimed at a number of different audiences. It is meant to (1) serve as both a ‘playbook’ of sorts for the administration and the Common Council that make decisions everyday that affect the housing stock of the City; (2) guide the City’s Planning Commission and Board of Zoning Appeals as they deliberate land use decisions brought before them; and (3)inform the development decisions of private for‐profit developers as well as the City’s non‐profit housing partners and neighborhood associations throughout the City. Finally, this annually updated Plan is for both existing and potential residents of the City of Syracuse to inform and create dialogue among the citizenry as to how to improve upon the City’s rich neighborhood history to move toward a bright and sustainable future. Click here for the complete plan. Click links below for each neighborhood.